After my great success with re-reading Sylvester by Georgette Heyer, I decided to re-read another book by her, The Foundling. I chose this one because I rated it very highly on LibraryThing, but I didn't remember many of the details about it except that it was about a very quiet Duke who wanted an adventure away from his overly involved relatives and retainers. And that is what this book is about! I would say that this book is not really a romance novel in the way that many of Heyer's Regency novels are. Yes, there's a man and yes, he falls in love with a woman, but that is in zero ways the main point of this novel. The Foundling is a coming-of-age tale. It has some hints of Understood Betsy in that it's about a very coddled person who has no real idea about how the world works finally going out and realizing that he can fend for himself without anyone's help. The main character is Gilly, Duke of Sale. His parents are both dead and he has been brought up by well-meaning but suffocating relatives and servants his whole life. He is a very kind person who avoids confrontation at all costs and he's small for his age due to being sickly as a child. But now, as he nears 25 years of age, he's sick of being told what he can and can't do and sets off on his own adventure to help his young cousin out of a dilemma. What follows is typical of a Heyer novel - the Duke must interact with many middle-class and lower-class people, all of whom are well-written and sparkle with humor. And in the course of solving any number of small matters and a few very big ones, he comes into his own - he gains confidence, takes charge of situations and very firmly realizes that he does not have to answer to anyone. And what's so wonderful about Gilly is that he does all this without ever becoming unkind or arrogant - he stays just the way he always was, but just asserts himself more. On this read-through, I didn't love The Foundling as much as I did when I was younger. And maybe that's because when I was younger, I could understand Gilly wanting to go out and experience the world for himself and learn more about his own limits. This time, I was more aware of the stereotypical beautiful blonde bimbo and the high-handed ways in which aristocrats dealt with lower-class women. But Gilly himself was nothing but kind and loveable, and perhaps this book suffered a bit for me after the high I experienced re-reading Sylvester and falling even more in love with it than I had the first time. Regardless, these two books have made me realize that I have many, many Georgette Heyer novels - and Terry Pratchett novels, and Jane Austen novels, and so many others! - that I can re-read and immerse myself in once more, and that in itself is a great treat! I love the descriptive and adoring way you speak of Heyer, and it makes me want to give her books a try. I have at least 5 digital editions that were hand picked when all her books went on sale from Sourcebooks, and I need to get immersed. You and I have such similar reading tastes, so I know that I will love these. Not sure where to start, but I will report back once I have gotten a couple under my belt. Very nice review today! I was surprised on re-reading this to find how much I liked it, I'd never considered it a favorite. I think that I actually appreciate Gilly more now that I am older - how as you say he remains true to himself. The book has some great characters. I've always thought Gideon deserved his own book! And I agree about Gideon! I would marry him. 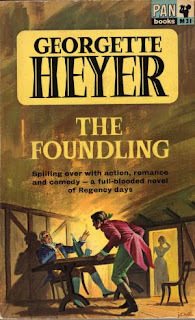 I am having a big Heyer binge at the moment and am surprised how well they stand up to re-reading, given the relatively simple premises of so many of them. The writing is just so witty. It's so good! I love Sylvester and Phoebe together. Aw, this sounds like such a dear book. Understood Betsy is wonderful -- it's so good to see her becoming more and more competent and eventually taking care of little Molly. Aw. And she gets her very own kitten! And it's too dumb to drink milk properly. I love Georgette Heyer so much, I think she's an unrecognised genuis. Mainly I love her for her characters. I love the boy in 'The Foundling' - she wrote once that she based it on one of her own sons. I don't mind her class snobbery as much as you do, though I recognise it - it always seems to be to be a historically accurate depiction of life at those times. It would be very odd and wrong to have a Regency-era duke who wasn't somewhat aware of class distinctions! That said, I'm so glad you enjoyed reading 'Sylvester' again - its one of my favourites.